Mesquite: Paddock lived in Mesquite, Nev., about 80 miles northeast of Las Vegas. USA Today reports that he's owned a home since 2015 in an upscale retirement community complete with an 18-hole golf course. His home was being searched Monday. No criminal history: Police in Mesquite say they've had no previous contact with Paddock, while police in Las Vegas say there's been nothing beyond a minor traffic violation, reports the New York Times. ISIS claims responsibility: The Islamic State, meanwhile, claimed responsibility for the attack and said Paddock converted several months ago, but it provided no evidence to back up the assertion, reports the AP. The FBI later made clear it has found no connection between Paddock or any terrorist organization. Pilot: NBC News reports that Paddock had his pilot's license and owned two planes. He also had a hunting license in Alaska. 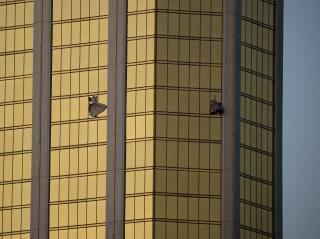 Police found more than 10 guns in his hotel room at the Mandalay Bay Resort and Casino. Companion: Police tracked down a female companion named Marilou Danley, 62, but they say she has been cleared in the shooting. Paddock checked into the hotel through Danley's ID, reports the Atlanta Journal-Constitution. She has been described as Paddock's roommate or girlfriend. I'll say it again. Someone needs to that POS wayne loppieair of the nra that his interpretation of the 2ND Amendment did NOTHING to protect these victims and the victims of All of the other senseless shootings. It did however serve the Perpetrators very well. That also goes for those that made an industry out of promoting gun Sales. His girlfriend seemed like a shady character. She got the name Danley by marrying a guy from Arkansas. I highly doubt MaryLou is her real name. She has a way with words and clothes. The "family" always seems to have the same comment.